We have made it our mission to inspire creativity in business, education and daily life by developing the most innovative and easy to use software tools. MindMeister lets you share your mind maps with as many friends or colleagues as you want and collaborate with them in real-time. MeisterTask’s flexible project boards adapt to your workflow and make sure everyone is on the same page. Managing tasks has never been more intuitive. 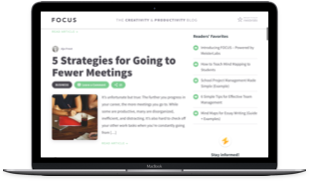 On FOCUS we share advice, tips and experiences on how to work creatively and collaboratively. Be inspired and discover solutions.